After Bennett's departure from Jewish Home, former IDF chief rabbi Rafi Peretz tapped to lead the party in 2019 elections. The Jewish Home party has chosen a former IDF chief rabbi to succeed former party chairman Naftali Bennett, following his departure last month with Justice Minister Ayelet Shaked and MK Shuli Muallem to form the New Right (HaYamin Hehadash) party. Rabbi Rafi Peretz, who served as the Israeli army’s chief rabbi from 2010 to December 2016, was nominated by a public committee formed by the Jewish Home to select a new party chair after Deputy Foreign Minister Tzipi Hotovely (Likud) declined overtures from party leaders to lead the faction. In a statement released by the Jewish Home Sunday, the party announced that Rabbi Peretz’s nomination will be brought to the Jewish Home central committee for approval Monday night at 8:30 p.m. The party’s Knesset list for the April 9th elections will also be brought before the committee for approval tomorrow. The 63-year-old rabbi, a native of Jerusalem, holds the rank of Brigadier General, and previously served as the dean of the Otzem military prep academy in Yated, near the Gaza Strip. 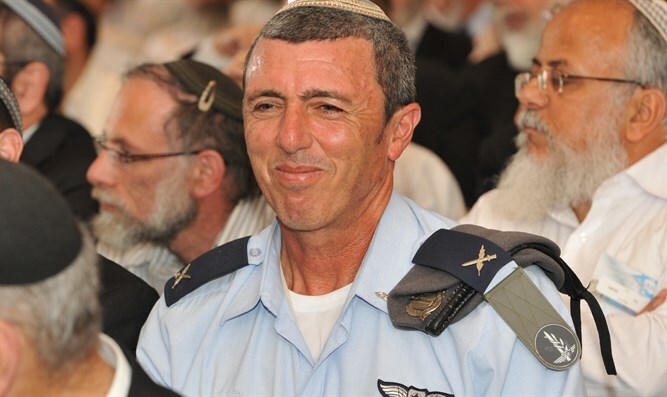 During his mandatory IDF service, Rabbi Peretz served as an Israel Air Force helicopter pilot. Rabbi Peretz is married to Michal (née Heiman) and has 12 children. The family lived in the town of Bnei Atzmon in Gush Katif prior to the 2005 Gaza evacuation. The town, which was founded by residents of the Sinai Peninsula evicted following Israel's surrender of the area to Egypt, was relocated again in 2008 and renamed Naveh, where Peretz currently resides.